I know you've been waiting impatiently for some Red Rock pics. My goodness it's a gorgeous shawl. I just need you to bear with me a little bit longer. I've been busy with a slew of friends who have made their way to SF to visit! There's simply not not enough time in the day for ALL the fun! To keep you from clicking away in a furor I give you my above stash enhancement. 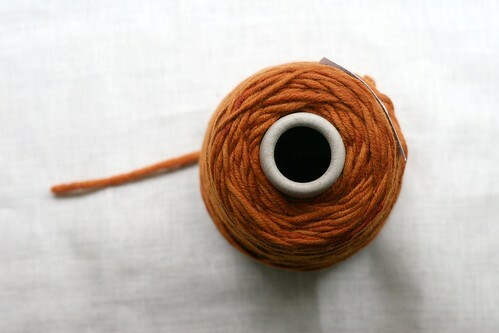 Vinya from Artfibers. It's a soft bulky merino wool. Artfibers is a very cool shop in downtown SF. The studio space has all hand dyed yarns from their own supply. Everything from acrylic to silk to beautiful blends – they have something for everyone. They even encourage you to test the yarn by doing a "yarn tasting". It also a provides us knitters yarn in whatever yardage you want! How could I deny myself this gorgeous looking cone? I haven't decided yet what I want to make with my new yarn but I'm thinking perhaps another- wait for it – infinity scarf. What can I say? I know what I like. Felicity Cowl: Pattern is Here! This is understandable that money makes us free. But what to do when somebody has no cash? The one way is to get the personal loans or term loan. It’s great that you have friends visit and that you know what you like! Two very important things in life (of course, there is knitting too)! Can’t go wrong with a good infinity scarf!! Love the colour.